Communist Party of Greece celebrates its 100th Anniversary in New York | Fight Back! New York, NY - On the evening of October 13, members and friends of the Communist Party of Greece (KKE) celebrated the 100th anniversary of its founding at the Kefalos Society in New York City. The highlight of the evening was an address about the current situation in Greece and the world by Zissis Lymperidis, a member of the Secretariat of the Central Committee of the KKE. Before his address, various friends and fraternal parties of the KKE from New York City presented short greetings. After the greetings there was a presentation of a video showing the heroic history of this party and the struggles they have engaged in. The KKE is one of the few communist parties in existence today that can claim a history full of all phases of the struggle of the working class to establish socialism. For the majority of its history the KKE has had a clandestine existence. It has organized among Greek workers and farmers legally and illegally. The armed resistance to the Italian fascist and German Nazi occupation during WW II was led by the KKE and its fighters. When British and U.S. imperialism re-imposed the Greek monarchy and aided right-wing forces to take over Greece after the war, the KKE led a guerilla war of resistance for three years before succumbing to a military defeat, which resulted in thousands of progressive and left-wing activists being imprisoned and murdered in concentration camps. 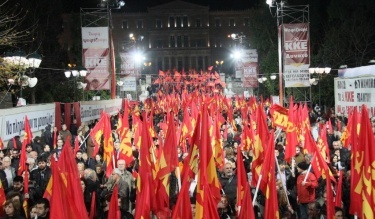 In present day Greece, the KKE is represented in the national parliament and carries out political and economic struggle throughout Greece among workers and farmers. Comrade Lymperidis’ speech spoke of these struggles and explained the positions of the KKE. He went to say that these governments frequently pave the way for the return of right-wing governments. This was perhaps one of the most relevant comments for the Marxist-Leninist left in the United States and our work, since there are many activists who considered themselves on the left and espouse reformist positions that support the idea of a ‘better’ or more ‘humane’ capitalism. The celebration presented many thoughts and examples of struggle from one of the most battle-hardened and experience Communist parties in the world. This work will continue in Greece, when the KKE will be hosting the International Meeting of Communist and Labor Parties on November 23-25 as the peak of its 100th anniversary celebrations.